Are you familiar with Flirty Aprons? It has become my favorite place to buy aprons for myself and gifts for others. My sister in law is always in the kitchen when I visit and I have gotten her some cute aprons. I think she displays them in her kitchen more than wearing them! I received the apron shown here and it is beautiful and Flirty and my husband really loves it~no more said there but this hot mama likes it too! When I sat and looked my apron over, I cannot believe how well made these are! Every stitch in my Flirty apron from the cute ties to the lovely ruffles, to the pockets in the front is perfect, with no strings hanging off or sewing errors that I could find. I am impressed with the quality of my Flirty Apron! This is so true as I am a plus sized gal and fit is not an issue with my apron. It also fits my husband well but he refused letting me take a picture in the apron! What a poor sport he is LOL! 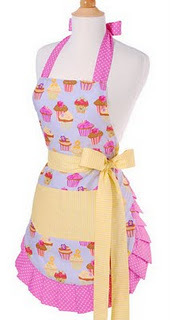 Actually Flirty Aprons also has a men’s line and here is a picture to share with you! I love the men’s line as well! Another addition to your beautiful Flirty Apron are matching dish washing gloves with a cute ruffles trim to match the accent ruffle in your aprons. They are just too cute! What a perfect idea for a gift for mom or a special woman in your life, a Flirty Apron and matching gloves! I would love that if it were given to me! I would like to thank Flirty Aprons for the apron to review and I am appreciative of their gift! I hope we can work together again in the future as they are a class act!